Overlooking the city and flooded with natural light, all 35sqm superior rooms luxuriously furnished in rich mahogany and feature contemporary décor. A marble entrance area opens into a carpeted bedroom area appointed with one king size or two single size beds, a large desk and TV cabinet. 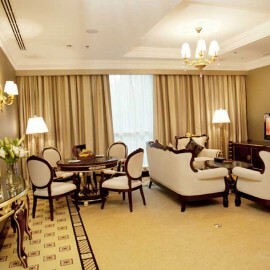 A lounge area offers relaxing sofa and seating to unwind after a busy day or enjoy in-room dining. The spacious bathroom appointed in marble with mahogany furnishings and designed for maximum comfort. Guests can enjoy a bathtub with integrated shower, sink with vanity counter, bidet and toilet. All room category can accommodate two adults and two children under 12 years in existing bedding with some connecting to a one-bedroom suite. 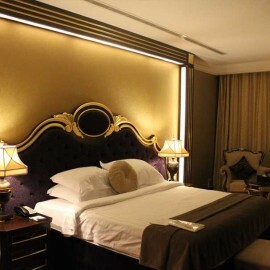 214343, Al - Barsha 1, Dubai, United Arab Emirates.